There will be times you want to remove a device from your Duo account, or maybe modify some settings on your account. 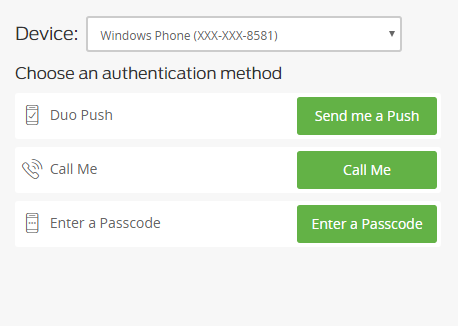 The process consists of authenticating with Duo and choosing My Settings and Devices. To start you will first need to visit the LinkToHealth where you will be prompted to log in using your username and password. If you are having trouble with your password you may reset it or contact the OSU Health Plan at (614) 292-4700. If you have not registered for your account previously, please see Duo - Registration Setup. Click on the link My Settings & Devices on the left hand side of the screen. If you cannot click My Settings & Devices you may have turned on an optional feature during the set up process that can cause issues. Please see Automatic Settings if you are unable to click the link. You will then need to authenticate using Duo to prove you are who you say you are. You may use whatever authentication method you prefer. Please see Duo - Authenticating. 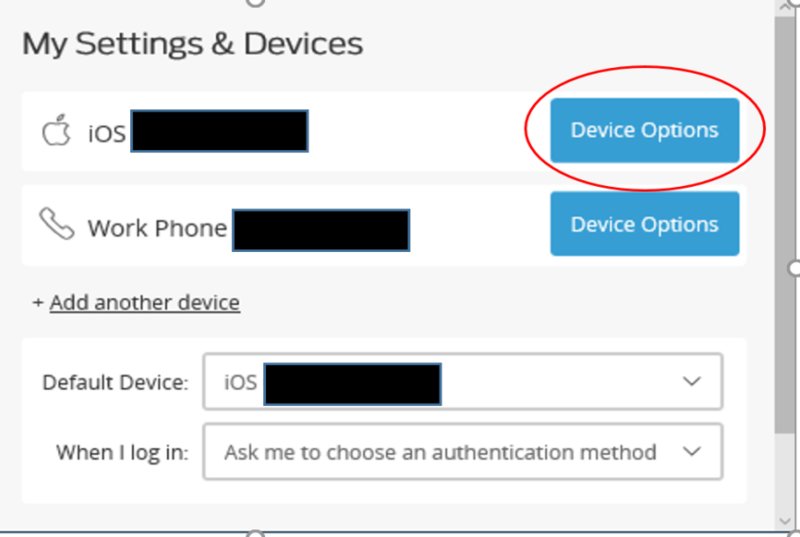 Within the Duo frame you will see a drop down list that reads My default device is: and your standard default device (the first device you added) will be selected. 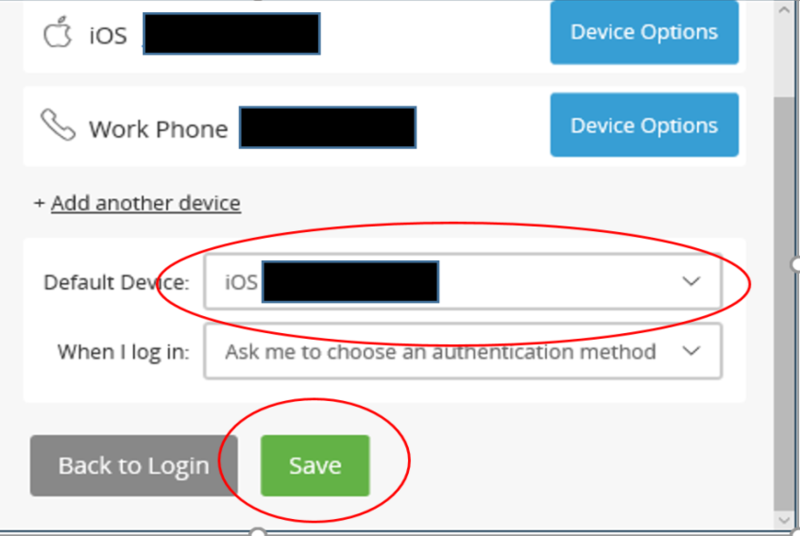 You many drop open the list and select any other device you have added to your account. Click the Save button to complete the change. If you are not certain how you can add additional devices, please see Duo - Adding a Device. Listed in the Duo frame will be all of the devices that have been attached to your Duo account. The options you are able to modify will vary depending on the device type. Look for the device you would like to modify the options of and click the Device Options button. 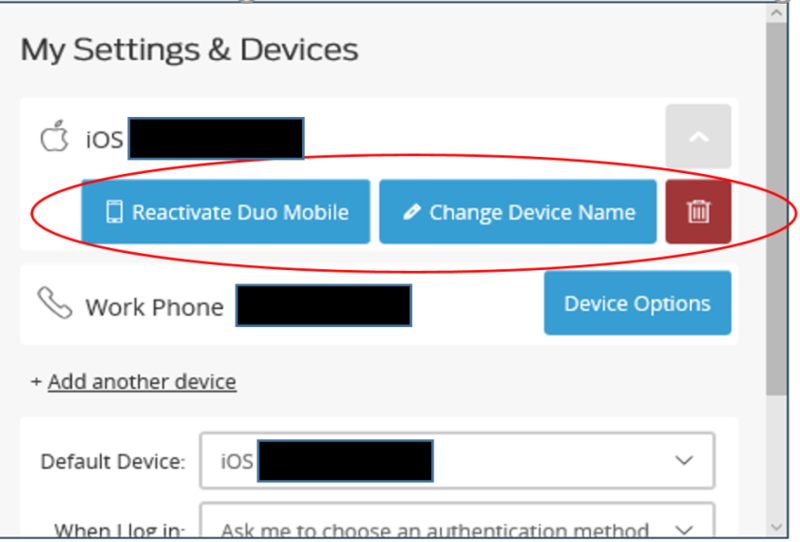 Used when you have to resynch your mobile device using Duo Mobile to your Duo account. This may be necessary in instances where you have uninstalled and reinstalled the app, upgraded your device or in rare instances the application loses its connection to your account. In this case you will just need to walk through the steps and rescan the QR code as seen in Duo - Adding a Device. Within the Duo frame one of the first options you will notice is Automatically send me a: with the options of Duo Push or Phone Call. This means when you access a site restricted by Duo the system will automatically send you a Push or a phone call to your mobile app on your default device so you do not have to go through the process of generating one yourself. This option can also be turned on during your initial set up in Duo however it is NOT recommended. Turning this option on makes it a little harder to make changes to your settings at a later time, even adding an additional device. 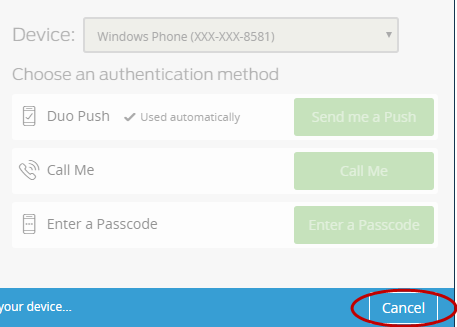 To turn it on check the box Automatically send me a: and then select the radio button for the type of code you would like to receive, Dup Push to your mobile app or a phone call. More often people will need assistance in shutting this feature off. If the feature is turned on when you access Duo to make changes you will notice your active area becomes greyed out. You cannot choose any of the options you normally would. Your mobile device will send you a Duo push or a phone call asking you to verify. That is to be expected. You need to ignore the device and do NOT approve the request. Approving the request will just authenticate you into the system bypassing the My Settings & Devices option. Click the Cancel button at the bottom instead. Now you will click the My Settings & Devices link on the left hand side to access the settings. Follow the same authentication steps shown previously. Take the check mark out of the box to shut off the automatic Push or Call and click the Save button to save your changes.